Torque, torque and more torque! This package is nothing but power. The 14.4-volt cordless impact driver and the MForce drill put super strength in your hands for the toughest tasks. Despite being beastly powerful, this impact driver is shockingly compact and lightweight, with a total length of under 7 inches and weighing in at a mere 3-1/2 pounds including the battery. But don't let that mislead you -- impacts per minute range from 0 to 3,200, with a maximum tightening torque of 1,240 in./lbs. And the power doesn't quit, either, because the nickel-metal-hydride battery packs a greater capacity and longer run time than standard nickel-cadmium versions. Even though it fits snugly in the hand, it's an absolute dynamo in the power department, and the variable speed is smooth as silk. There are two nifty light-related features on this Makita, and we weren't all that impressed with them on paper. But in reality, the phosphorescent rubber bumper immediately catches your eye, whether you're rummaging in your truck, fumbling in your garage or scanning the job site for any left-behind tools. And the integrated high-output LED really does light up the workpiece, saving you time and frustration. We always like to see tools with easily accessible and easily replaced brushes, because if your tool's in the repair shop, it's not making you any money. The MForce drill/driver is just as powerful and just as rugged as the impact driver, with the same high-efficiency nickel-metal-hydride battery power. Speed ranges from 0 to 400 and 0 to 1,300 rpm to tackle just about any drilling or driving job, with a Makita-made Shift Lock Drive that lets you switch quickly between modes, locking out the clutch for drilling work. And like the impact driver, the drill in this combo is compact, lightweight and easy on your hardworking body. The rubberized grip absorbs any vibration and feels great in your hand. Want to impact your life? Buy an Impact Drill! Impact Drills are about 10x the cost of a cheapo drill at the shop. But WOW are they worth it. The Makita in particular is a great device. The 14.4v lasts a long time (much better than the regular drill). You don't realize until you get the torque at high and low speed how much you needed it. - no more stripped screws. I have driven 1/2inch bolts into the wall with this bad-boy and I know I didn't want to have to do that with a wrench. There is NO WAY that a regular drill could have done it. It's also great for quickly spinning wheel nuts off of the car to change a tire or do a brake pad change etc. Get the 14.4 instead of the 18v. It is lighter and more controllable. That helps a lot when you're trying to balance the wood, hold the bolt etc. I have the NiMH, I don't know if the new LiON "LXT" is worth it. The older NiMH works very well for me so I don't see the value in the extra money for Lithium. Get this kit instead of an impact on its own to get a second battery. I use the regular drill in parallel to drill the pilot holes etc so it's quite useful. The standalone light is good too, but I don't use it - I don't work in the dark :) The light on the impact is really nice to have. Having 2 batteries will allow you to use both at the same time as well as allowing you to go all day - the second will charge while you work with the other. What are you waiting for!? Click BUY! I bought this for the drill and the good price about one year ago. The drill is very good, the impact driver and light are both AMAZING. Wonderful set! The impact driver is the best drill I've used in my 10 years of construction. It fits in small spaces that other drills can't and the power is amazing. It's especially nice for making and installing cabinets and the LED light comes in handier than you think. It's comfortable and light and is easier on the wrist because of the size and weight. I recommend this drill to anyone who wants to make their job easier. I work in the A/C industry and require the use of cordless drills on a daily basis. 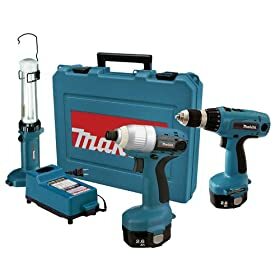 As many of you can imagine, if you have experience with tools and understand the frequency of the need to use them, you will appreciate the quality of Makita products. This drill kit in particular is very useful because it's good weight balance for handling, and a solid grip for the drills. This is my 2nd set of Makita products, and the main reason is because I believe they have great engineering into the details of their products. The light on the impact driver is extremely helpful in low light conditions - and the belt clip helps to free up a hand when you need it. Since I spend a great deal of time in low light conditions in the attic, the fluorescent light comes in handy and makes the job much easier to maneuver. 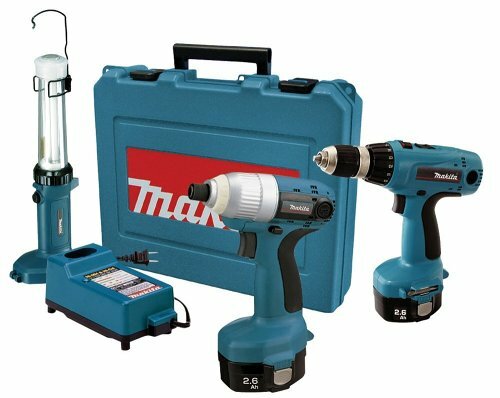 If you are in need of a drill kit and expect a solid product, go with Makita - you will be very pleased with this set! My first delivery was "Left at front door." I was home and live in an apartment building with interior corridors. I've had countless deliveries left by UPS at my door but this was the first that went missing. (Fedex) The product is perfect for my occasional use on a distant property with no electricity--I could even charge the batteries on the way--it's several hours driving. I called amazon.com customer service and expected to get the third degree but they just had me wait about a week to be sure it didn't turn up. It didn't and I called them back. They sent it out right away and it arrived (At my workplace) in perfect condition. No long telephone menus, no long holds, courteous and clear language, and a follow-up exactly as promised. 5 Stars for the Customer Service Dept. Reps.
no es la primera vez que compro este producto,anteriormente lo compre para un amigo y hoy estoy muy contento con la calidad del producto que decidi comprar uno para mi y otros para algunos miembros de mi familia, gracias por tan buen producto. AS A PROFESSIONAL CABINET MAKER FOR OVER 50 YEARS, I FIND THIS PACK A LIFE SAVER FOR INSTALLATION AS WELL AS AT THE SHOP, I'VE HAD A 12.0 VOLT MKITA IMPACT DRIVER, AND IT WAS MORE THAN ENOUGH POWER. BUT THE 14.4 WOW THAT'S MORE THAN I'LL EVER NEED. IT PERFORMED VERY WELL WITHOUT GETTING OVERHEATED FOE EXTENDED USE. THE PRICE CAN'T BE BEAT, AND THE LIGHT, WHEN I CRAWL INSIDE A CABINET. IT'S FANTASTIC TO SEE EVERYTHING.IN ALL EXCELLENT PRODUCT, AND RELIABLE TOO. This is a great combo. The impact driver is a must and this is the best battery powered work light I've used. It puts out a lot of light and is way better that the flashlight type lights. I've pushed the impact driver way harder than it's probably intended but it's still going strong. If your looking for a great deal on a driver kit, this kit is it!! This kit has it all, I purchased this kit mainly for the impact driver, I looked elsewhere on the net and all were priced around the same, but only for the impact driver. So with this kit you get a impact driver, driver drill, and work light. And the best part is they work with my other 14.4 makita tools. If you have the older nimh battery tools, this kit will add to your versatility. Have been using this for about 2 months. Only used an impact driver once prior to buying this, but that convinced me to buy one. I tend to buy Makita tools (also own some Milwaukee). This combo set is great. I mainly use the impact driver for installing cabinetry. It is light enough to use one-handed, freeing up your other hand for positioning the work; it is simultaneously powerful enough to drive just about any screw into any material- without breaking it. Furthermore, it has relieved some elbow tendonitis by making the screw-driving process less laborious. The MForce drill is also a great power driver in and of itself. I bought this drill to replace an older on I had. The drill and the drill driver work great. I've gotten out some tough screws that I wouldn't have been able to do without the drill driver. I also like the light on the drill driver. It helps a greast deal when your in a tight corner and cant see the screw head. I really didn't care about the light that comes with it but so far I'ved used it a number of times and it really comes in handy. Great value for this set of Drill, Impact driver, and Fluorescent work light. Impact driver is best useful tool of the set. I wanted an impact driver for constructing a pole barn, but thought it was too expensive. then the package with the MForce drill was offered at nearly the same price; i could'nt resist. the impact driver more than met my expectations; it drove 6&8" lag screws as well as 4" construction screws and roofing screws. it worked all day on three battery charges,with the drill making pilot holes for the 3/8" dia. lags. they outperformed me, but then i'm 70 years old. the building (14x14x40) was done in two weeks. I liked it so well that we got another kit for my brother-in-law for Christmas.